The Hargrave 76 captures the essence of her owner’s vision. Her performance is solid and her fit and finish beyond reproach, but it’s the whole package taken together that’s truly extraordinary. Read our boat test here. The Hargrave 76 shows the unexpected beauty of custom builds with her human scale. Every custom yacht I look at makes me think differently about every other boat I see. I like that fact about custom builds, but don’t assume I think they’re better than other, comparable boats. Because I don’t. 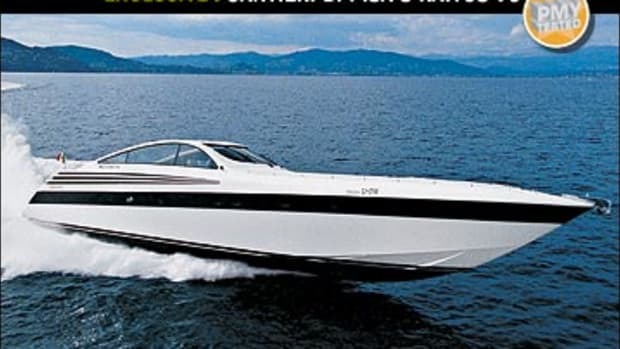 Instead, I believe custom boats offer insight into a person, with all his or her idiosyncrasies, rather than a closer look at endless combinations of focus groups and research and the corporate we-do-it-this-way-because-we-always-have mentality. Because, you see, the personality traits that come through—those imprints left on the shroud, if you will—are what make a boat the function of a human being. 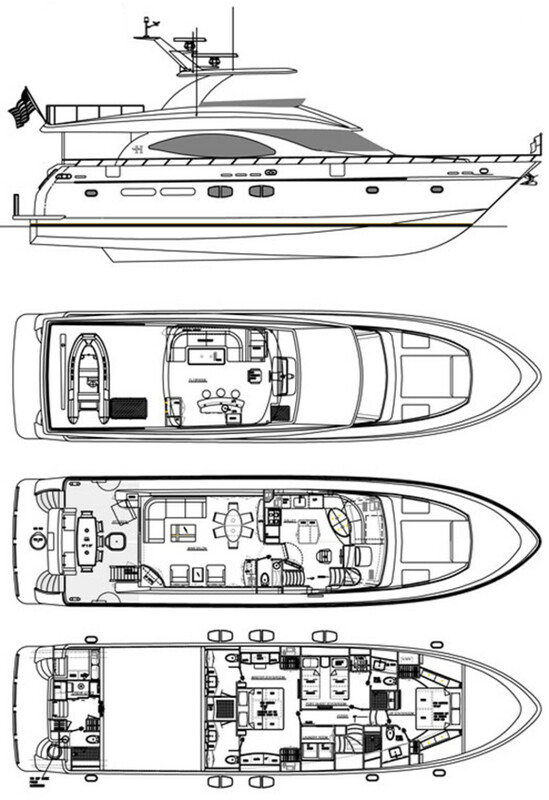 The design considerations for boats can be much more challenging than, say, a building, since the question of interior volume may be the issue that seems to present the ultimate compromise: Can you get the square footage you need to make it work in this LOA? Ah, but square footage is not the answer to the question—we live in three dimensions and therefore something sketched on paper may not always work. That’s why some builders create a three-dimensional model of an interior before moving forward with the actual build. Hargrave, it would seem, simply designs the boat to human scale and ends up with something altogether pleasant and eye-opening. 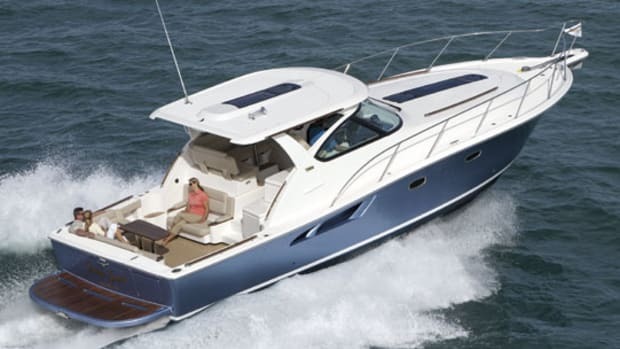 The Hargrave 76 is just such a boat. 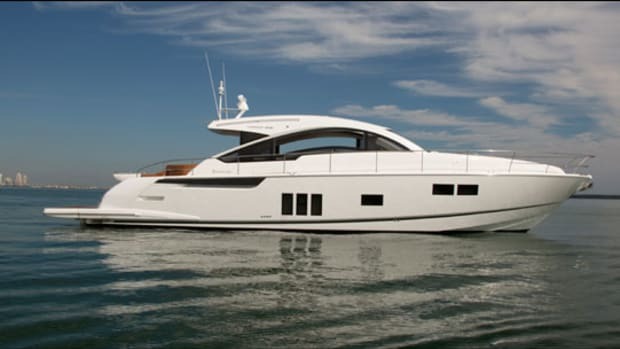 This flushdeck motoryacht has three staterooms plus a nifty crew’s quarters aft, and it makes my point for me. It sounds so simple: After all, boats wouldn’t exist without people to build them and go to sea in them and covet them. And yet, so many spaces on so many boats are so clearly designed as though a person would never set foot in them. Most notable of these are engine rooms, where the service points, if not accessible, are aptly named: As in you will need service—you won’t be doing it yourself. Now it’s one heck of a place to start talking about a boat—the mechanical spaces and crew’s quarters—especially on one with so many positive attributes as the Hargrave 76. But there’s a reason I want to start here. I misread my schedule at the Yacht and Brokerage Show in Miami last February and had to wait to get on the boat for some time. But there was a fair breeze even though it was hot, and I stood on the dock looking at her transom for much longer than usual. That’s when I noticed the height of the transom door, which leads to those crew’s quarters. And indeed, when I got my turn I went and stood on the sill of that door and stood up to my full, towering height of 5 feet 10 inches. And I could just barely feel the top of that door frame touching the breeze-tousled hair on top of my head. I couldn’t bump my noggin going through here if I tried, and if you know me, that’s saying something. Three steps down is the tidy crew’s quarters, where a skipper’s queen berth and a pullman berth share a space tucked behind a three-panel pocket door to port. To starboard is the head, the door of which is flanked by the two tallest sole-to-overhead hanging lockers I’ve ever seen. 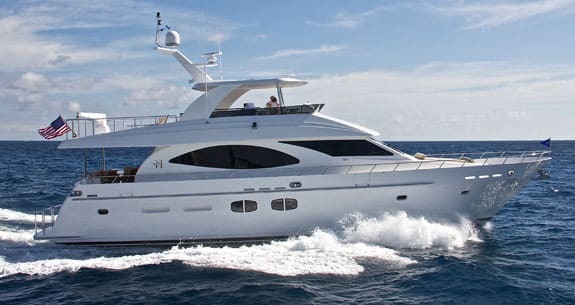 All of this is finished in Makore veneer joinery to the same level as the saloon and the rest of the accommodations onboard, but with one advantage: The centerpiece for this space is the gleaming, polished stainless engine-room door. Picture if you will a museum dedicated to the concept of a boat’s engine room. Such an idea came to me when I saw the polished stainless railing around each of the 1,150-horsepower Caterpillar C18 ACERT diesels, and if you have an active imagination you will get a sense of what it’s like to spend time in the main mechanical space on this boat. The engines sit on mounts below the painted diamondplate walkways, all the more astonishing when you consider that the lowest level of headroom in here is 85 ¼ inches. (It’s actually better than 88 inches for most of the space.) Rigging is seamanlike and organized, and service points such as duplex Racor fuel-water separators are readily accessible, as are the Racor fuel filters for each of the 27-kilowatt Phasor generators. Solid equipment choices such as Naiad stabilizers, a Torrid water heater, and a Sea Recovery watermaker complete the picture. 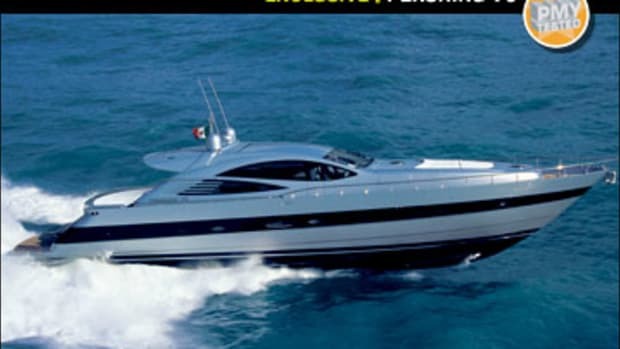 But there’s more to this boat than gleaming white spaces punctuated by stainless steel. Her saloon immediately put me at ease as I stepped through the sliding glass door from the afterdeck. The space has a 9-foot-by-6-foot L-shaped settee to port, opposite an angled 40-inch Samsung flatscreen to starboard, placed high in its curved, satin-finish Makore cabinet. The formal dining area—centered on a custom teak dining table expandable with an 18-inch leaf—is at the forward end of this space, but I noticed there was no Alice in Wonderland feeling of stepping ever deeper down the rabbit hole, probably thanks to the height of the ivory Ultra Vinyl overhead, as well as the large windows looking out to both side decks and beyond. Step forward to the lower helm, past the country-kitchen-style galley to port. A destroyer-style wheel and Glendinning binnacle set the stage, while two Furuno NavNet 3D multifunction displays share the satin-finish console with a pair of Caterpillar engine-management screens and ancillary equipment. A handy pantograph door grants access to the starboard side deck for easy docking if inclement weather forces the skipper below. While standing at the helm, a look over my left shoulder gave me, well, a view of the galley. Maybe it’s a quibble, but I would rather the chef give up some stowage space to improve my sightlines a bit more. That galley offers a slew of stainless steel GE appliances and satin Makore stowage lockers and cabinets surrounding an island topped in Kodiak granite. The dinette table forward and to port of the lower helm will surely be a gathering place for guests, as will the galley island, which I can see doubling as a chart table so you can find your next anchorage well before nightfall. Head up the stairs abaft the Zwardvis helm seat to the flying bridge. Now you’re beginning to realize just how big a 76-footer can be. Beneath a hardtop that looks like it will be here until the end of time sits a centerline helm with a Pompanette seat, a single Furuno plotter, engine monitors, and more. Abaft that is a U-shaped dinette to port and a bar with three fixed stools to starboard. While the hardtop may end there, the deck just keeps going and going (it shades the entire afterdeck below) until you find a 1,600-pound-capacity QuickLift davit. The tender stows athwartships but, in a breezy anchorage, I would launch her first thing and set up deck chairs. This is where I’d want to spend my time, both under way and on the hook. It’s easy to get around the exterior spaces of the boat, thanks to 17-inch-wide side decks, so access to the bow area with its spacious sunpad is no problem, and good railings help you feel secure. 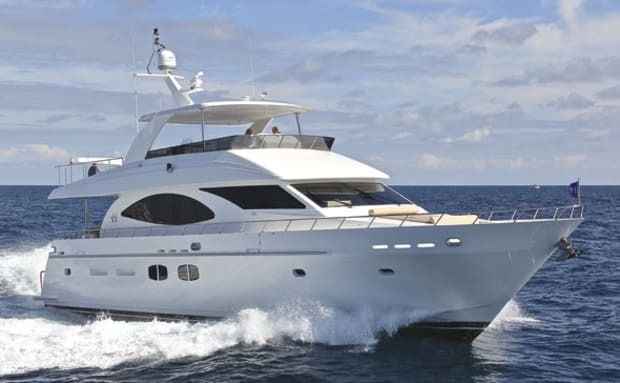 At sea, the boat handles very well, especially considering her windage—this is a big 76-footer. Her Jack Sarin-designed running surface was conceived to solve some perceived problems that arose in other designs. “The design features a full-length hard chine becoming a fairly aggressive spray knocker continuing all the way forward to the raked stem,” Sarin wrote in his comments on the project. 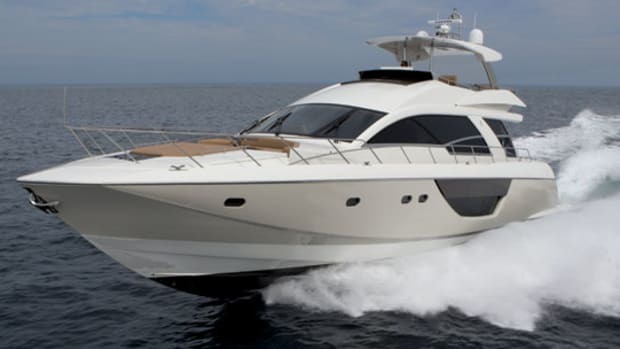 “Coupled with a stylish amount of flare to the forward topsides the hull should be very dry with a minimum of side-wetting.” Our sea trial was no test of spray, considering the flat seas and light winds. If you’re hunting for a boat in this size range, I expect you’ve begun to notice the word semi-custom being bandied about. 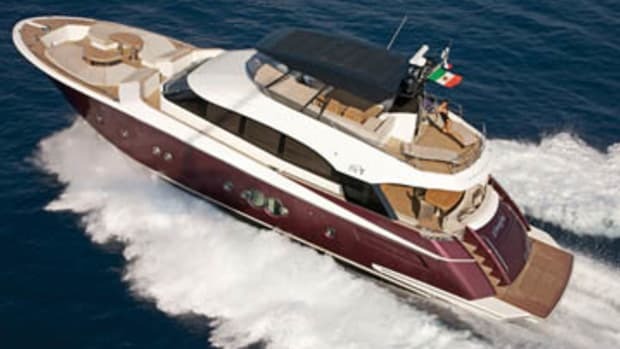 There are traditionally styled motoryachts as well as those with a European aesthetic—all told, a fair number are out there from which to choose with a range of accommodations, performance, efficiency, and appearance. 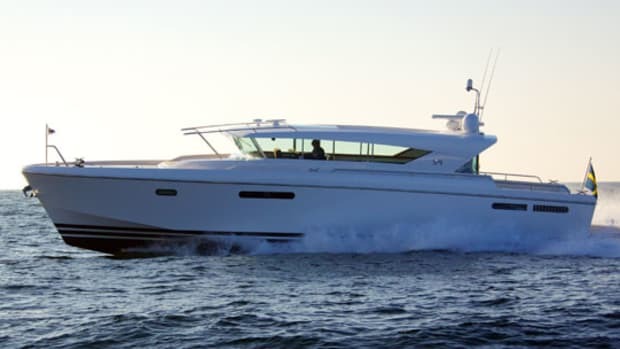 And Hargrave Custom Yachts has been in the mix for some time. 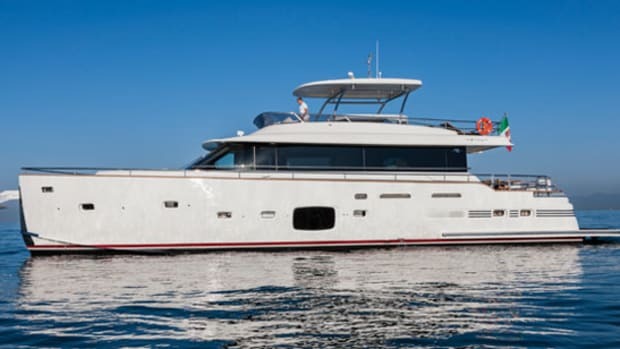 The company got its start as the design firm of Jack Hargrave, the yacht designer for such brands as Burger, Hatteras, and Amels, among others. Hargrave lived by the dictum that, at the end of the day, a boat had to perform at sea, according to the company. 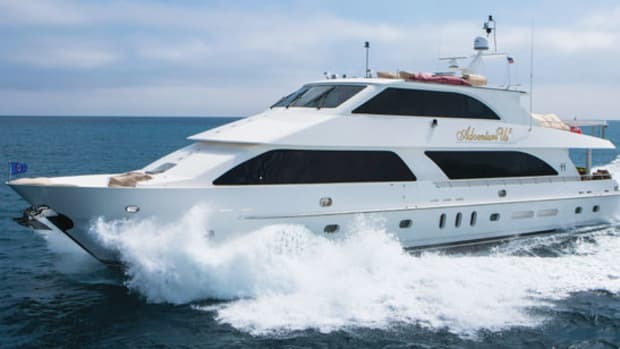 “We understand our market because we understand our owners,” says Mike Joyce, chairman and CEO of Hargrave Custom Yachts. “Because we build custom yachts, we know what they want because they tell us. And we come to the right combination of quality, value, and customization by working with owners in a partnership.” If such a partnership results in a 76-footer with interior volume like this, we’re listening. Stairs to starboard of the lower helm bring you to the accommodations, where a delightful amidships master stretches across the full beam, with a huge built-in chest of drawers to starboard and a desk or vanity to port, as well as two hanging lockers. Two-pane side windows provide natural light to the space, but are situated high enough to offer a bit of privacy even without the blinds drawn. The same style windows illuminate the master his-and-hers head with central shower. Curving cabinet fronts seem to make the most of the space, with convex lower cabinets complemented by concave upper ones. Along the passageway forward, there’s a laundry room with side-by-side washer and dryer to starboard and a guest stateroom with twin berths (convertible to a double) to port. This section of the boat sums up for me in two points what I was talking about earlier: First, that guest stateroom actually has the highest overhead of any location I could find, at 90 ¼ inches, in a vestibule area as you enter the room near the door to the en suite head. And second, the fact that laundry takes precedence over adding more guest accommodations is a decision that speaks to me. Better to have fewer people and plenty of clean towels. After all, who wants to join their friends on a yacht and end up in a bunk stateroom? Don’t answer that. Good night, honey. Head forward to the VIP stateroom and you’ll find two steps in the passageway on the way there. The forward stateroom has a large island berth (72 inches wide) and plenty of stowage, with a hanging locker and delightful en suite head. Going through this boat, from the mechanical spaces to the accommodations to that flying bridge that fired my imagination, I got to thinking. If every boat is a compromise, then it’s a wonder to me that more yachtsmen don’t consider a custom build. At least then the owner can set the terms of each compromise, rather than a design team or a focus group. That’s what I like most about custom builds: They make me think about the owner, who is clearly a person who often has a vision of the possibilities, which, in the right hands, turns into something beautiful. We would love to take this boat through the Inside Passage to Southeastern Alaska, where the views of playing orcas and pinetree-studded shorelines could be enjoyed in the bracing fresh air on the flying bridge. Like us on Facebook and let us know where you would take the Hargrave 76. 520 gal. fuel, 360 gal. water, 4 persons, 300 lb. gear.